For all you folks who have waited long and hard for the next-generation Lexus LS to arrive, at least you’ll get plenty of engine options. Or so it would appear, if the latest LS rumors are indeed true. 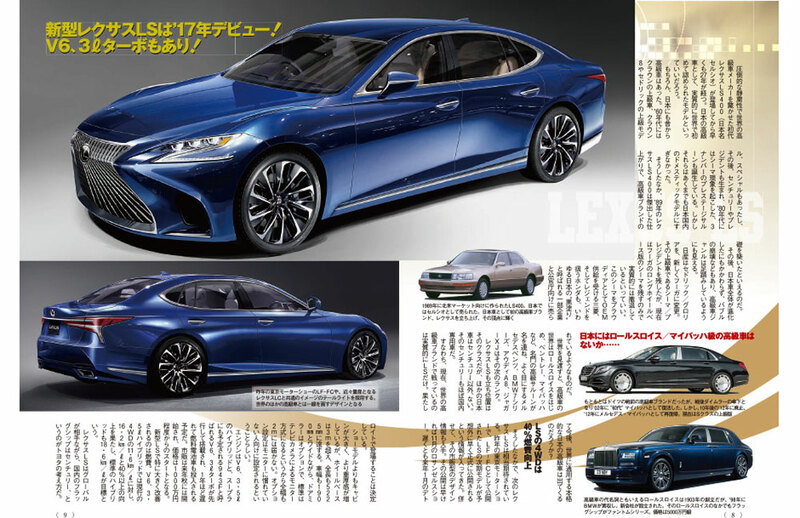 According to Japanese magazine Best Car (via Lexus Enthusiast), the fifth-gen Lexus flagship will be offered with a 3.0-liter turbo, or the 3.5-liter V6 hybrid and 5.0-liter V8 slated for the LC 500 (the same one that’s currently available in the GS F and RC F). A year after the 2017 Japanese launch, a fuel cell model should be made available. That would add further validity to an earlier rumor that an LS F will be arriving in 2018, “with a twin-turbo V8 pushing out 611 horsepower,” as noted by Lexus Enthusiast. As far as the hybrid versions go, Best Car also dropped some fairly impressive fuel economy numbers: 37.9 mpg for the all-wheel drive variant, and 42.7 mpg for the rear-wheel LS. Which, if true, would be beyond impressive. Furthermore, the new LS is expected to go sans side mirrors, a move that reflects new laws in Japan which allow for cameras to take over. The U.S. is expected to allow as much in 2018. All these improvements — and undoubtedly more — won’t come cheap, though. The base new LS is rumored to run you upwards of $95k; approximately $14k more than the current base price.